The UN has sharply criticised the Iraqi government's human rights record, in the two months since a security plan was launched in the capital, Baghdad. The UN mission for Iraq said Iraqi authorities had failed to guarantee the basic rights of about 3,000 people they had detained in the operations. The report said four million Iraqis were at risk because of lack of food. A statement from the office of Iraqi Prime Minister Nouri Maliki dismissed the report as lacking credibility. The UN Assistance Mission in Iraq report again called for access to Iraqi government files on civilian casualty figures. The Iraqi authorities disputed figures in the previous UN report. The UN said in January that 34,452 civilians were killed and more than 36,000 wounded in 2006. These figures were much higher than any issued by Iraqi government officials. The UN said those figures were provided by Iraqi government ministries. 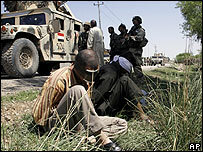 The UN report, which covers the period from the 1 January to 31 March 2007, said that some 3,000 people have been arrested in security sweeps since the Baghdad security plan began in mid-February and it condemned Iraq for failing to guarantee due process rights to those taken in. It also criticised the court system in general saying that deliberations at some trials involving life imprisonment or the death penalty only lasted for minutes. Overall, more than 37,000 people are being held in Iraqi and American-run prisons, many of whom have not been charged or sent for trial. The report describes the situation in Iraq as a "rapidly worsening humanitarian crisis". It said daily living conditions were worsening despite billions of dollars earmarked for reconstruction efforts - an estimated 54% percent of Iraqis lived on less than a US dollar a day while the unemployment rate had risen to 60%. In wide ranging report on many aspects of life in Iraq, also highlights the deterioration of the freedom of expression affecting media and media workers, religious and ethnic minorities and academics who are continuously targeted by religious extremists and armed groups in all areas of Iraq. Universities were being targeted with 200 academics killed since 2003, and 12,000 doctors had fled the country. The report also describes how there was collusion between the Iraqi security forces and militia groups involved in the sectarian violence.